Cone: A solid or hollow object which tapers from a circular or roughly circular base to a point. A right circular cone is a cone whose base is a circle in which there is a line perpendicular to the base through its center which passes through the apex of the cone, which is made by having a right-angled triangle turning along one of the sides that form the right angle. The slant height of a right circular cone is the length of an element. Both the slant height and the element are denoted by L.
The altitude of a right circular is the perpendicular drop from vertex to the center of the base. It coincides with the axis of the right circular cone and it is denoted by h.
If a right triangle is being revolved about one of its legs (taking one leg as the axis of revolution), the solid thus formed is a right circular cone. The surface generated by the hypotenuse of the triangle is the lateral area of the right circular cone and the area of the base of the cone is the surface generated by the leg which is not the axis of rotation. All elements of a right circular cone are equal. Any section parallel to the base is a circle whose center is on the axis of the cone. A section of a right circular cone which contains the vertex and two points of the base is an isosceles triangle. Remember this figure (unrolled lateral area), it will help you to solve some tricky questions in cone. 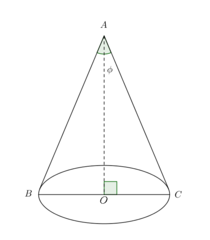 Lateral Area: The lateral area of a right circular cone is equal to one-half the product of the circumference of the base c and the slant height L.
Volume: The volume of the right circular cone is equal to one-third the product of the base area and the altitude. 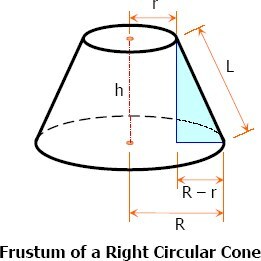 A frustum of a cone or truncated cone is the result of cutting a cone by a plane parallel to the base and removing the part containing the apex.